For anyone wondering/asking (sooo many!) about my new hair, It's not finished. I got it done yesterday and despite walking out the salon happy with it, after sleeping on it and styling it myself I just dont think the tone is quite right. So Im going back later today get it warmed up a little bit, its ever so slightly too cool for my complexion. I'll post a photo of how it is now soon and you'll know what I mean when you see it. The colour is fine, but the tone is just not quite right. I either need to go really ashy or more of a honey colour! Obviously I'll keep you updated when its done to my preference! I think the lighting in the salon made it look different from how it was in daylight which is annoying, but it's being sorted! Us blogger's also have hairdresser woes (; Update: It's still NOT finished, but it is semi fixed! At least it's not as mental as it was earlier! I'm getting it properly sorted on Wednesday... a long time to go with not right hair if you're overly sensitive about your hair like me! I'm sitting here playing Civilisation V and dancing to The Academy Is... Having the best time but I have too much to be getting on with. I might actually take my laptop to the salon... At least then I can positively procrastinate! Love this all black outfit especially those shoes! Fabulous cool total black look. I love the aa discopants, want to have them, too! The shoes look amazing! I feel like I constantly wear my Disco Pants from Topshop! I think your hair looks amazing! Seriously suits you. And I really love that Zara tee. I have that Kors watch as well :). Love this outfit! Especially the disco pants - reminds me that I need to get a pair! I love those wedges more and more each time i see them! This is one of my faves! You look lovely, and the style is right up my street! Hope your hair gets sorted how you wish! The more I see that zara top, the more I need it! I love your arm jewelery! Can't wait to see your new hair!!! I love your outfit because black outfits always look so chic! I've said it once and i'll say it again- i love ella taking your photos! 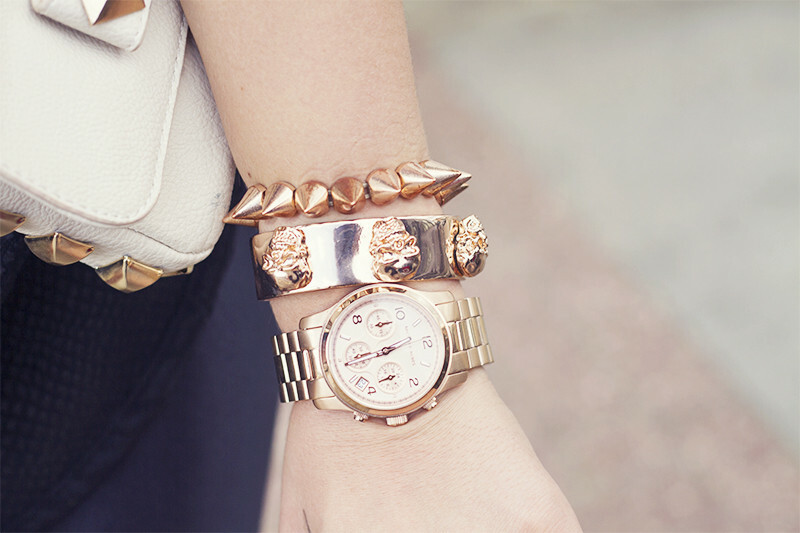 Im totally obsessed with your accessories, they are all totally awesome, perfect and I want them! Love all your acessories here but the skull bracelet has to be my favourite! i love the disco pants and the bracelets! Very chic outfit all in black - love the shoes! Looking forward to seeing the new hair - I've just had mine done too, a lot shorter! american apparel disco pants are perfection! love your jewelry, and so jealous you have a michael kors watch! Great details, the bracelets, watch and clutch are amazingly beautiful! Lily have to say love your style you really know how to do fashion ... I'm a lot older and style is something I never could get right .. Fabulous blog and YouTube channel!!! you've swayed me into really liking textures now haha have fun at bestival! also check out the GIVEAWAY on my blog at the moment ! I love the disco pants and the shoes soo much! They also have these types of clutches at H&M! Your hair looks amazing. 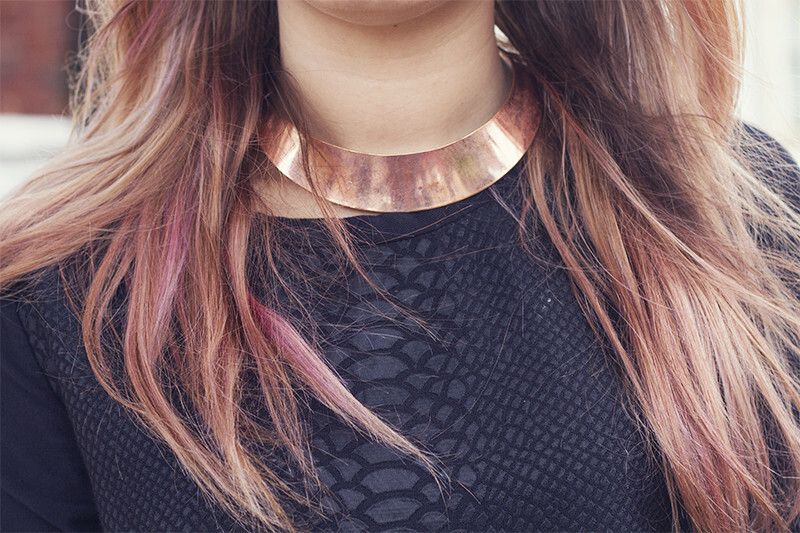 I love the hints of rose gold throughout your outfit and hair too! Lovely minimal outfit. love the croc texture of that top, looks amazing! Seriously, those disco pants are to die for. love those golden accessories and the wedge heels! All black - sheek and amazing! I need those wedges in my lifeee!! Hope your hair finally gets sorted out on weds- I hate not having 'right' hair either! Last year I tried to dye my hair a completely new colour to my already dyed hair and it went green and I had to wait 4 days until they could fix it. :/ worst 4 days!! Stunning outfit, I love the colour combination of black/white/rose gold. You look so tall! Love your shoes and your shirt!! You look great to me and you could be wearing hair like Oprah on her latest magazine cover and you would still look awesome lol. I really love the Zara top. love that zara top, it looks perfect for autumn!